What happens if your Water Heater doesn’t go to its Happy Place? We all have our own unique happy places. Happy places are those places where we find enjoyment and relaxation. Happy places for some might be the golf course. For others, it might be a hike in the woods. Wherever your happy place is it’s a place you go to when life gets to be too much. Think of what happens when you don’t make visits to your happy place. The pressure of life gets to be too much. After a while the buildup is too much and you find yourself yelling at people in traffic or throwing your new nine iron into the woods because it was the iron’s fault you kept slicing your Titleist DT golf balls into the water. Do you know your water heater has a happy place? Yep, it does. And, your water heater’s happy place is determined by a simple little valve. I’ve inspected a few homes recently where I found this valve or Temperature Pressure Release Valve (TPRV) leaking on the hot water heater. What is that and why do you need to be concerned about it? It’s a concern for safety purposes and possible damage to the home. Water leak from TPRV and discharge pipe. The thermostat in a water heater is supposed to automatically shut off the heating source when the desired temperature is reached. If the thermostat malfunctions, the water heater may have a continuous rise in temperature as well as pressure (from expansion of the water). The temperature and pressure could continue to rise until the pressure exceeds the pressure capacity of the tank usually (300 psi). If this occurs, the super-heated water will boil and expand with explosive force, and the tank will burst. This is bad. Very bad. Think of when you’re not able to go to your happy place. The family dog becomes a kick ball and/or golf clubs get launched into the woods out of anger. As a safety mechanism, hot water tanks are fitted with temperature pressure relief valve (TPRV) which is designed to open when the tank reaches a dangerous temperature or pressure. 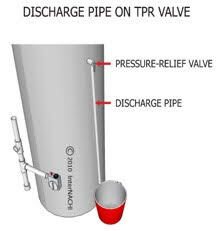 Most TPRV’s are set to open at water temperatures above 200° F and/or a pressure above 150 psi. Think of this as your water heater going to its happy place. Sometimes, due to age or malfunction, they open and leak water. If you see water leaking from the TPRV pipe, or at the bottom of the water heater, you should call a licensed plumber to evaluate and repair it. 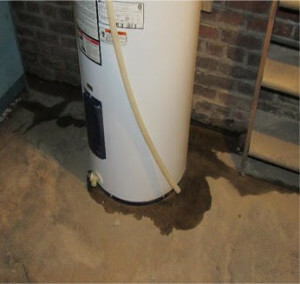 Where is your water heater located? Great question, If it’s located in a crawl space or unfinished basement, then leaks don’t pose as much of a damage risk. If they are located in an attic or finished part of the house they should be placed inside a pan which collects water in case of a leak. Also, that pan should have a pipe connected to it where water will be discharged outside of the home. Another safety mechanism that could be added is an electronic shut off valve that will shut off the water supply to the water heater if a leak is detected. 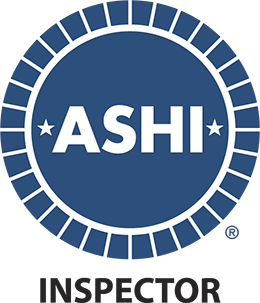 At minimum, hot water heaters should be checked annually by a licensed plumber to ensure that they are working properly and the safety mechanisms are functioning as intended. You want your water heater to go to its happy place. Just as you want you to go to your happy place when the pressure builds your way. Take a few minutes and go look at your water heater. You don’t want to place your water heater in the “out of sight, out of mind” category. Because if TPRV isn’t working properly your water heater won’t get to its happy place. That means you’ll go to your unhappy place. And that’s never fun for anyone!